When it comes to beaches in Southeast Asia, Thailand has some of the best you can find. From Koh Phi Phi to Phuket, you are promised to return with a lot of great memories and even tan lines. Besides the beautiful sea and amazing views, these islands are buzzing with activities as well. You will be able to meet people of different background from all over the world gathered at these islands to create new memories with your family and friends. 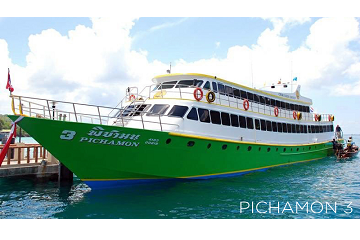 Getting to either Kho Phi Phi or Phuket by ferry is very easy when you make your online booking for a ferry ticket with ChaoKoh Travel Center. Do it securely and conveniently through Easybook from wherever you may be. Gone are the days when you have to queue up at the counter for a ferry ticket. As the largest land and sea transport booking website in Southeast Asia, you can purchase your ChaoKoh Travel Centre tickets on our website and mobile app within minutes by following these few simple steps. 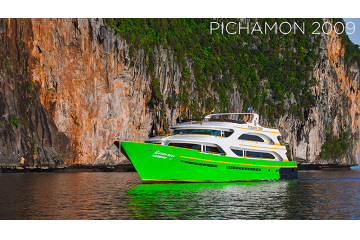 This high-speed boat service from Thailand can accommodate from 250 to 550 passengers. Taking the ChaoKoh Travel Center ferries are considered the fastest and easiest way to get to the islands of your choice. The ferries are also equipped with air conditioning systems to keep yourself cool before arriving at your sunny destinations. You can find trips from Koh Phi Phi (Tonsai Pier) to Phuket (Numchai Pier (Visit Panwa)), as well as vice versa trips when you book with ChaoKoh Travel Center through Easybook. Do make sure that check out the full schedule for those trips on Easybook website with ChaoKoh Travel Centre. There are many trips in a day provided by ChaoKoh Travel Center, so book the ferry ticket that is most suited according to your itinerary. 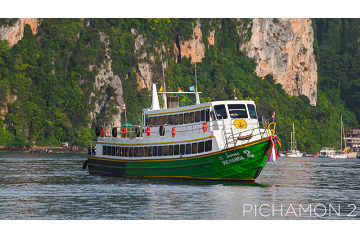 Tonsai Pier is one of the busiest piers around as ferries are arriving from everywhere into Koh Phi Phi. It is surrounded by hilly landscape and a beautiful view with great places to eat or shop along the streets. Over at Numchai Pier (Visit Panwa), you will find plenty of luxurious accommodations to enjoy a great holiday with your family or friends. You can show your electronic Order Summary for ChaoKoh Travel Center at the check-in counter, but it would be advised that you print out the ticket to ensure a smoother process. Please make sure you arrive 90 minutes before departure for check-in purposes. Go ahead and take that well-deserved beach holiday that you have been thinking about with your friends and family. Book your ChaoKoh Travel Center ferry today to create new memories. Easybook wants to be a part of that journey with you by providing you a great platform to book you ferry ticket. We look forward to serving your next trip with ChaoKoh Travel Center!